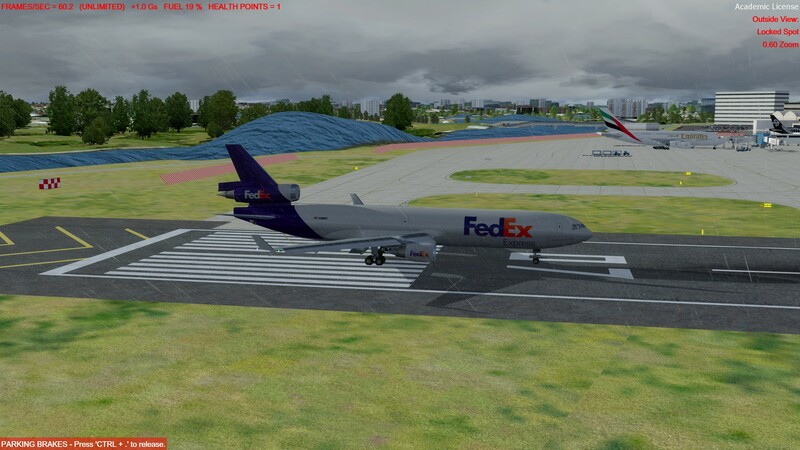 This is actually pretty amusing as far as i'm concerned, after all it's freeware, and the phrase "you get what you pay for" certainly applies here, but the airport scenery itself, while not payware quality, really isn't too bad, and is way better than the default. I checked this with FT YSSY and default and didn't have this issue. Must be with the scenery you're using. The 'Airport Background Flatten' vector polygon should cover the river at the back, then everything will be flatten and the mini tidal wave will disappear. It can be done with SbuilderX. You haven’t got Ozx installed as well, I had a similar problem with Pearce, and when I removed flatten files from Ozx, my new freeware airport was fine. If you have orbx search in that folder for YSSY bgl and turn them to off. Orbx Vector does have a YSSY in there. See if that does anything. If not then I’ll see if I can edit the bgl in ADE tomorrow when I get home. My suggestion is to light the fires and get the hell out of there real quick!! Thanks. I don't have Ozx installed, but I do have Orbx ftx global, NA, SA, and EU land class, and Vector installed. I double checked Vector AEC in ftx Central, but I see no entry for YSSL, perhaps because I have this freeware airport installed..?? I also looked thru all the Orbx folders I have in P3D, and I do not see a BGL in there for YSSL, if you can tell me where specifically I should find it i'll see if I can track it down. I went back to YSSL Rwy 7 this AM, just to take another look, the mound of water is still there, but I'm mistaken about it being "in motion", it's just the "wave action" (provided by REX4) that was giving the illusion of being slowly moving, but it's stationary for sure. I have it too in my default YSSY at runway 7. I have FS Globel and when I uncheck it in my scenery library the wave is gone. Do you have FS Globel installed? The correction polygon worked perfectly, no more mound of water as you can see in the picture below. No worries, it was a less than 5 minutes of work.